Tatiana Maslany, Super Babe Back on Orphan Black! Home Tatiana Maslany, Super Babe Back on Orphan Black! Tatiana Maslany is back with her dozens of alter-egos on “Orphan Black” airing on BBC America. Before she became the trophy of the week, Maslany was an unknown Canadian actress just trying to hook a part. “Now I’ve experienced incredible things in acting classes where I feel like I transcended what acting can be,” she says. Canadian actress Tatiana Maslany stars in the BBC America’s new series, “Orphan Black,” premiering March 30. Captain Hollywood here! My story is one of adventure, danger, romance, and excitement. Throughout my years in Southern Calilfornia, I have moved silently through Hollywoodland, watched it swell and grow and have traversed the back lots and studios of the movie world. Each new adventure has been sparked by the acquisition of Hollywood treasures: toys, games, curiosities, oddities, and obscura, much of it gilded by the magic and muse of motion pictures; much of it discovered in dark, musty, forgotten places. It started out with eBay, where it was discovered that I had a talent for popular culture rarities and arbitrage. I then moved to Amazon, where boomer movie toys and collectibles reign supreme. 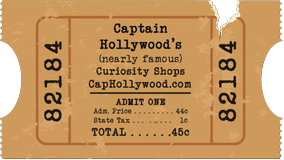 Now I offer my own sensational website that joins the many platforms that make up Captain Hollywood's chain of Curiosity Shops. I invite you to explore the possibilities and see what wonders await. Some of the things you'll see will seem a little strange, some startling, some astonishing, and a visit to Captain Weird's Attic will certainly challenge your experience (mind your step as you mount the stairs). 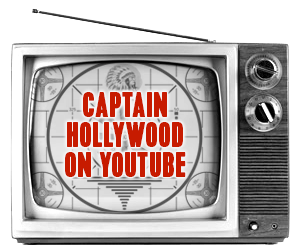 I'm Captain Hollywood, navigating the waters of curious excellence, always in search of the funusual. . . . welcome to the shop! Uber Babe Catherine Bell Conquers Geekness! Titus Welliver Stars as “Bosch” in Compelling Amazon Series! ←Black Belt Laura Vandervoort is Beautiful “Bitten” Star!